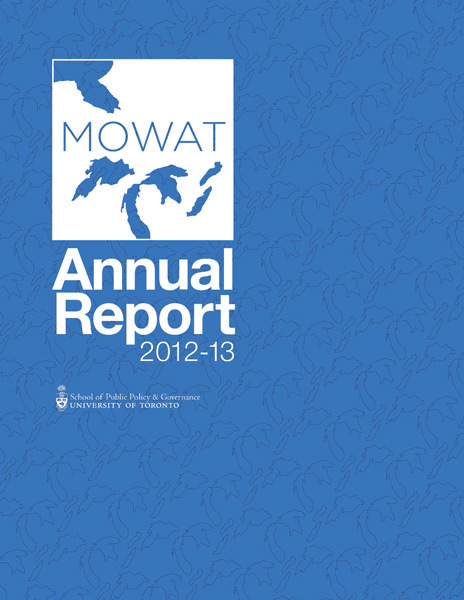 Mowat Centre’s 2012-13 annual report with updates on our year’s publications, events, staff and media presence. We at the Mowat Centre are proud to share our second annual report with you. 2012-13 was marked by growth, diversification and maturation. Our work on intergovernmental policy and Ontario’s place in the federation remained our core business. Our projects on equalization, fiscal balance, changes to Employment Insurance, monetary policy and the new federal electoral boundary map set the terms for many public debates and had a direct impact on several policy changes. Our record of quality has allowed us to focus additional resources on two growing areas of importance: the future of the Ontario economy and the transformation of government. Our partnership with the Ontario Chamber of Commerce and many of Ontario’s economic stakeholders has produced our Emerging Stronger series. This policy work has set the stage for upcoming major research projects on the future of the manufacturing sector, the economic importance of diaspora networks and the federal corporate tax system. Together, these projects are coming together to outline a broad, non-partisan economic agenda for Ontario. Our partnership with KPMG and many public sector stakeholders has allowed us to invest time and resources in our Shifting Gears series, which identifies transformative efforts to make government smarter and faster. We are proud that some of our recommendations have been acted upon by government and are helping deliver more public value to citizens. As our research streams expand, we have also been able to take up additional challenges. We played a catalytic role in creating the new Council of the Great Lakes Region and Mowat will incubate this new organization during its start-up phase. With our Foundation partners and the not-for-profit sector, we have launched a new program of work – MowatNFP – designed to modernize the policy frameworks that govern the not-for-profit sector. And with our industry and public sector partners, we have strengthened our MowatEnergy hub. Both of these research hubs have released their first major works and are having a real impact on the policy conversations in their respective sectors. The past year has been marked both by rapid growth and the departure of some key staff. These changes have required more focused business planning, consistent with a more mature organization. In 2013-14 we will produce our first formal strategic plan, which is currently being developed with the support of staff, our Board and key partners. The Mowat Centre is experiencing two positive changes that will nonetheless challenge us as an organization in coming years. Our funding and revenue streams are becoming much more diverse, with $500,000 in secured research contracts in the first half of 2013-14 already. And we are increasingly being seen not only as Ontario’s voice on public policy, but an important national public policy think tank. Both of these developments are important to our long-term sustainability. But they also require us to remain nimble, make smart choices when faced with exciting opportunities, continue to refresh our organization, and more rigorously assess our performance and outcomes. All of these will be necessary in order to remain a high performing organization that continues to deliver excellence in research and value in the face of increasing demands and a larger number of partners. I am confident that the choices we have made over the past year and will make in coming years will continue to reflect our commitment to modernizing Canadian public policy frameworks and strengthening the province of Ontario. All of us at the Mowat Centre would like to express our ongoing gratitude to the School of Public & Governance and the University of Toronto and its administration for the supportive and nurturing academic home they provide us. Our work would not be possible without their continued support.